Categories: Poems, quotes and music | Tags: books about relationships, borderline personality disorder, BPD, helpful books for therapy, i'm okay you're okay, John Gottman, therapy, transactional analysis, wise words | Permalink. Strong inter-personal relationships are vital to maintaining good mental health, but mental illness can put enormous strain on those relationships. That’s when therapy can help – and not just those with the mental health diagnosis. I wrote this last summer, and although technically Mental Health Awareness Week is now over, this seemed like an appropriate post for me personally, to mark that week and its important theme this year, of ‘Relationships’. A few months ago, my husband and I had a rare opportunity to go out in the evening together, while my parents looked after the children. We took the ‘bold’ decision to go out for dinner, rather than go and see a film; ‘bold’ because I have found it so difficult to sustain meaningful and non-confrontational conversations with him as our relationship has deteriorated over the last few years while I have been struggling with my mental health. The evening was relatively uneventful until I raised the possibility of taking on some additional responsibilities outside work, which he was strongly opposed to because he believed I wouldn’t have enough time, and that it would affect the whole family if I took on too much. That in itself was a fair point to raise as a concern, but one of the features of our relationship over the last few years has been that we have each fallen into a particular way of responding to each other, that I believe comes from both our childhoods. I tend to react to him as a parent; and I think that he tends to react to me as a sibling. A long-term illness of any sort, can put an enormous strain on relationships. When it comes to mental illness, symptoms can significantly distort someone’s thinking about themselves and the world around them (including other people). They may be ‘ill’, but they can also appear unrecognisable to their loved ones. It can be difficult for the ‘healthy partner’ to focus their anger at the situation they find themselves in, on the ‘condition’ itself, when that condition may have no obvious physical manifestation. It can become easy to blame the person themselves, who becomes synonymous with their condition. There can also be the temptation to think that because one party in the relationship suffers from a mental health condition, the burden of psychological examination and change must rest with that individual. ‘You’re the one with the mental health problem; I’m okay’. Whereas there needs to be a recognition not just of the fact that the ‘healthy partner’ is often liable to suffer emotional strain themselves, for which seeking help would not just be beneficial to them, but beneficial to the relationship ; but that we all behave in ways that are patterned on our childhood experiences. If there are difficulties in our relationship, irrespective of whether or not one party has an illness of some kind, it is important for each person to think about their own unconscious patterns of interaction, and what might be triggering their responses. That evening, my husband responded to me as if I were his thoughtless younger sibling who had hatched a ridiculous plan that he saw it as his duty, as the older, wiser and more responsible party, to put a stop to. I responded to him as if he were a parent trying to exercise control over my actions and trying to tell me what to do, without trusting me to make my own evaluation of the situation, and to come up with a sensible decision. I am relying on my own therapy to effect a change in both of our lives, and for the good of our relationship. But some of the perspectives that therapy gives you are hard to grasp if you have never been in that setting. For the moment, I am doing all I can to work hard in my own therapy, in the hope that I will gain the skills and sense of self-worth to be able to work more effectively with my husband, on our relationship. My wish is that one day, we will enter couples therapy together. In the meantime, I hope that we can both try and respond to each other as the people that we are and each fell in love with – flawed as we might be – rather than as the projections of our childhoods. Categories: Attachment and relationships | Tags: borderline personality disorder, BPD, importance of relationships for mental health, marriage and projections, mental health awareness week, MHAW16, projections in relationships, projections in therapy, therapy, transactional analysis | Permalink. I went to my bookcase, opened it, and for no apparent reason pulled out a slim book of poems I hadn’t looked at in close to twenty years. The volume was called ‘Out of Danger’ by James Fenton, and opening its pages was like rediscovering an old friend. More than that, it was like rediscovering a part of myself and an influence that I had completely forgotten existed. The first page of the book was signed; I had bought it at a poetry reading by the poet himself. As I read, the words were not just familiar, though long unremembered; I could also hear James Fenton’s voice in my head, as he read them – the rhythm, the musicality, the pace. And as I read, I realised what an enormous influence he had had on my own poetry writing. Poems of my own from that time started to come into my mind, as his words, rhythms and rhyme schemes acted as a trigger and a reminder. All of a sudden it seemed strange that I could have forgotten that book and his poems so entirely, and along with it that part of myself that loved that poetry reading so much – but I guess it got lost in one of the several inventions and reinventions of myself that followed. 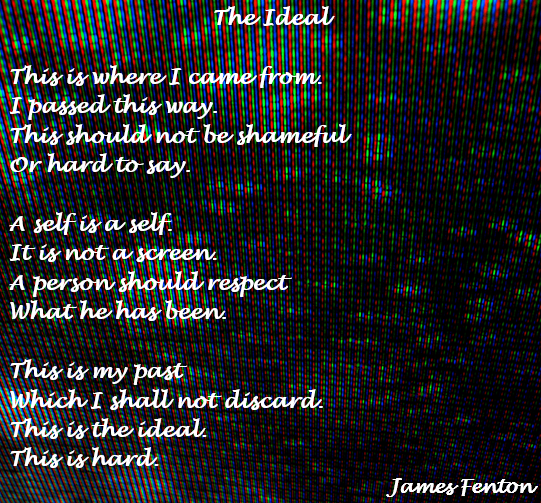 Categories: Poems, quotes and music | Tags: borderline personality disorder, BPD, inner child, james fenton, poetry, rediscovering the past, respecting the past, transactional analysis | Permalink. Do you love the inner child? Over the last few years I’ve been very much aware of the fact that my marriage has been ‘parental’ in nature. Even before our relationship started to deteriorate and I began to react to my husband in the way that I often react to my mother, I used to feel that he was the ‘strong one’ who I couldn’t do without, and I was the weaker, less competent, and more dependent party. It is no co-incidence that the Panic Disorder which set in with a vengeance when I left home to go to university, disappeared after we got together as mysteriously as it had first appeared. At the time, I interpreted it as a good sign which demonstrated the security I felt with him – it was only years later that what should have been the obvious parental parallel, hit home. In the language of Transactional Analysis, which I have been reading about lately in Thomas Harris’s book ‘I’m okay, you’re okay’, my husband tends to inhabit his Parent in our interactions, and I tend to inhabit my Child. Though of course there is also an element of my Child invoking his Parent, and vice versa – we each play the roles that we are used to, and they encourage and sustain each other. I sometimes wonder whether my realisation that I had chosen a marriage that in some ways replicated my parental home environment, in itself led to me more actively ‘seeing my husband as my mother’, and reacting accordingly. It’s hard to know whether I’m simply more aware of how triggering I find some of his words and actions; or whether I find them so triggering because of the realisation I have come to and the now almost automatic tendency to interpret his behaviour as parental. There was a particular section in ‘I’m okay, you’re okay’, that took me surprise and gave me pause for thought. It did so because that section took its own truth completely for granted, and yet it didn’t feel like something that was true for me. To quote from that section: “We fear the Parent in others; their Child we can love. One helpful practice in a difficult transaction is to see the little boy, or the little girl in another person….”. I had a similar experience of bafflement around a year ago, when I watched a drama series on DVD in which the female protagonist was asked by her therapist to imagine talking to her younger self. The idea was that by being aware of the compassion that she had for her ‘child self’, and by identifying with that part of her, it would be easier to show herself compassion in the present. In both cases, the assumption that one would feel care and compassion for either one’s own or another’s ‘inner child’ (in the way that one might feel compassion for an actual child) was unquestioned. And yet I feel unable to relate to that sentiment, in either case. Thinking about my husband’s inner child does not make me love that child, and it is not helpful in trying to relate to him. His inner child may not feel as crushing as his ‘parent’, but it still feels threatening. I feel like running away and shouting: “Keep your child to yourself, I want nothing to do with it, take it away. I don’t want to be burdened with your child, I don’t want to be taken over by your child, I don’t want to be suffocated by it or intruded upon, or violated by it. You deal with it – don’t make me do it. I can’t carry your child for you – you do it. I want absolutely nothing to do with it”. I want to run away from other people’s ‘Child’ selves – they frighten me. By contrast, my own Child does not frighten me – but I frighten myself when I think about how I feel about her. I am not a violent person, either in thought or in action. And yet, when I visualise my ‘inner child’ I don’t feel compassion – I feel a need to do her damage, of a very permanent kind. The words that go through my head are horrible, as are the accompanying images. The only reason it doesn’t feel more horrific to think those thoughts is that as they’re fundamentally about me and not about someone else, they feel justified. When I think of what I want to do to her, it feels as though she deserves it – that things would be better if she wasn’t around. When I try and imagine her, I feel angry; I blame her for not protecting me – the me that I am now. I somehow feel as though if she had done a better job, I would have ‘turned out better’. She failed, she was weak. She didn’t stand up for me – the person I was meant to become. She let me down – and maybe if she was simply wiped out, all her mistakes would be wiped out too. My therapist asked me where all these words and thoughts are coming from – whose voice it is that is actually running riot in my head. In the language of Transactional Analysis, it is my own Parent, coming down in judgment upon my Child. It feels not so much like an actual replay of particular situations experienced or sentences heard; but an agglomeration of disparate ‘parent data’ picked up in different contexts and at different times, patched together to make an ugly weapon of words. I have a better sense of where my feelings about other people’s ‘inner children’ comes from. My mother is a highly anxious person with little control over her emotions. If she feels it, she shows it. If she thinks it, she speaks it. And she seeks reassurance, constantly. She inhabits her Child – and that Child is both unable to hold others’ emotions, and unable to hold its own. These days I have put up such barriers between us and hold her so much at arms’ length, that if she tells me she is anxious about something, my response is to tell her that it is her problem, not mine. But I didn’t always have those barriers up; and even if I can’t remember much about the past, I can more than imagine that when I was younger, the torrent of her emotions would have felt like an invasion – like a force that threatened to suffocate and take me over. It was best not to call up that force at all – and so I learned to keep things to myself, and to deal with my emotions on my own. And so when I think of someone else’s ‘inner child’, all I can think is that I don’t want another adult to burden my Child with their Child. I feel guilty for saying that – because it feels hard, cold, and not at all compassionate. And it’s not as though I have an aversion to ever dealing with anyone’s emotions. I really want to be there for those I care about and I hope my friends would be able to attest to the fact that I have supported them through distress and pain, without feeling burdened or overwhelmed. But those were adult to adult interactions – and I wasn’t with them day in, day out. But ask me to try and deal with the Child part of those closest to me – for example, my husband – and it triggers an immediate desire to back away. It’s a good thing my husband can often cope with my ‘Child’, even if I cannot cope with his. When he ‘brought his adult’ and offered a compromise after an argument the other day, I would have loved to have been able to react in a similarly adult way, and to thank him graciously for the compromise, and move on. Instead, it felt as though the only possible reactions in my repertoire were to huffily accept while continuing to feel angry and thwarted, or to dissolve in tears of frustration and a need to be comforted. In a split-second I gave in to vulnerability and chose the latter; it was the better option, but still a far cry from the mature response of an equal partner in control of their emotions. Somehow I have a feeling that the more I am able to react in an adult way, the more compassion I might be able to have for my ‘child’; and the more compassion I can have for my own, perhaps the more I can have for others’ too. It’s a theory still untested, but an experiment I definitely need to do. Categories: Attachment and relationships, Therapy | Tags: borderline personality disorder, BPD, bpd and acting like a child, i'm okay you're okay, inner child, marriage difficulties, mental health, parent and child states, therapy, transactional analysis | Permalink. I realised that part of the video’s power was that the images spoke to me of the child part of me and of childhood – inner child and past child – and it was revealing in that it demonstrated the extent of the distortion of the lens that I use to view myself. At the end of that post I wrote that the song and video were proving to be a goldmine of therapeutic material, and that I thought I would be exploring that goldmine (or indeed, that minefield) for some time to come. Sometimes I worry that I don’t know how to ‘go deeper’ into a subject during therapy. I will spend a session or two talking about something and then come to a point where it doesn’t ‘feel finished’ but neither do I know how to go on. My therapist often says that if a subject is important, it will come around again, and we will ‘get another bite at the cherry’. This has proved to be true for a number of subjects, and is proving true again, which is why I have chosen ‘Inner child and past child’ for this ‘Memory Monday’ post. Since Christmas, my therapy has focused primarily on my relationship with my husband, and it has been very painful. Trying to honestly examine past and present patterns of relating which may be destructive, and talking about sides of me that I would rather deny, brings up not just feelings of guilt and shame, but summons up the parts of me that are resistant to the therapeutic process and that believe it is impossible to change. I have also been reading some challenging books that are helping me to re-evaluate some of my attitudes to relationships, including a couple of books on Transactional Analysis (which I will write more about, shortly). In that context, I have once again been thinking about the ‘child part’ of me – how I view it, and the ways in which it influences how I view the world and others, and how I behave. Thinking about ‘the child within’ has brought me back around to thinking about ‘Chandelier’, and though I haven’t watched the video since last March, I feel drawn to it again. I wonder how it will feel to watch it, but with an added year of therapy ‘under my belt’ and with hopefully a modicum of deeper understanding and self-awareness. I am constantly amazed at the way in which therapy uses the unexpected and ordinary events of our lives to illuminate the different parts of us; and how the same threads come back at different times and in different guises, simultaneously peeling back another layer of our defenses and adding another layer of richness to our understanding. Like the lines from T.S. Eliot on ‘waiting’ that are so important to me and to my therapy and which I keep reinterpreting and using in different ways; this song has become part of the fabric of the way in which I try to understand myself and a core part of my ‘therapy vocabulary’, and I’m looking forward to exploring it further. Categories: Memory Monday, Poems, quotes and music, Therapy | Tags: borderline personality disorder, BPD, bpd and relationships, mental health, sia chandelier, the inner child, therapy, transactional analysis | Permalink.